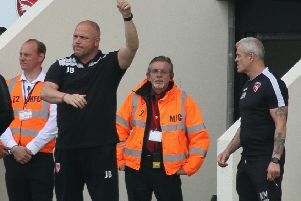 Tom Barkhuizen had mixed emotions after his first Morecambe goal nearly helped The Shrimps to a famous win at Portsmouth. The former Blackpool man opened the scoring at Fratton Park as Jim Bentley’s side raced into a three-goal lead. But they were pegged back with Jayden Stockley’s 95th-minute header seeing a dramatic game end 3-3. The 22-year-old, who spent time on loan with The Shrimps last year before making his move permanent in the summer, said: “It was nice to score my first goal. “I think that’s my seventh appearance now including last year. “This year my aim is to score more goals and I’m happy to help the lads out. “Unfortunately we couldn’t get the three points but it’s helped us to a point we would have taken. Barkhuizen revealed the dressing room was devastated at the final whistle having given all they had in search of an unlikely win. He said: “We’re absolutely devastated that we’ve thrown away a three-goal lead but if you’d have given us a point before the game, 99 per cent of the lads would have taken it. Stockley’s header meant The Shrimps were just 60 seconds short of a memorable away performance, Bentley having seen his side hit Pompey on the counter attack at will in the first half before they ultimately ran out of stream. Barkhuizen said: “I think the gameplan worked perfectly. “We’ve worked on it for the last couple of days, We’ve got a bit of pace in attack and we knew if we sucked them in and broke there would be big gaps. “That was certainly what happened for the first goal. “The discipline is hard when you’re chasing for so long though. Me, I just blew a gasket after 50 minutes. Everyone was dead on their feet. “We knew we’d come under some pressure and in six minutes added on they’ve scored in the fifth. Thankfully for the majority of the dressing room, the Notts County game comes on Saturday after the first free midweek of the new season. Barkhuizen said: “We’ve got a few knocks. “We’re all dead on our feet and there’s suspensions too.